Today we consider the currency anti-dollar index &VSUSD_Index composed on the basis of the Personal Composite Instrument – PCI technology. The currency index is designed to show the USD fluctuations against other segment of the Forex market. As a systematic FX market indicator we will use a portfolio of the most liquid currencies traded against USD: [EUR(12.7%)+JPY(14.5%)+GBP(17.5%)+CHF(19.1%)+AUD(18.1%)+CAD(18.1%)]/USD. The price of each currency is expressed in USD. The weights are defined according to the currency liquidity relative to the volume of international bank circulation. Get more details and the online index chart by clicking on the anti-dollar index page &VSUSD_Index. Note that &VSUSD_Index reaction on the US fundamental economic events is the most obvious and sustainable: the index forms a stable trend channel, meanwhile it is less susceptible to the fundamental events of other currencies. Let us remind you that today Core Retail Sales is to be released in the US. The indicator is released by the US Census Bureau every month and indicates the relative change in the retail sales volume of all the goods (except for cars), which amounts to 20% of the total volume. CRS is the monthly measurement indicator of all goods sold by retailers based on the retail stores sampling of different types. The index defines the consumer confidence and demand, and therefore, it can affect significantly investor preferences. Currently, &VSUSD_Index is waiting for new fundamental signals, and it is still in a state of uncertainty. Here we consider the daily closing/opening price chart of the given instrument. It was composed in NetTradeX trading platform. We can see that the price crossed down the moving average (13), and it is preparing for a fractal support breakout at 0.96916. 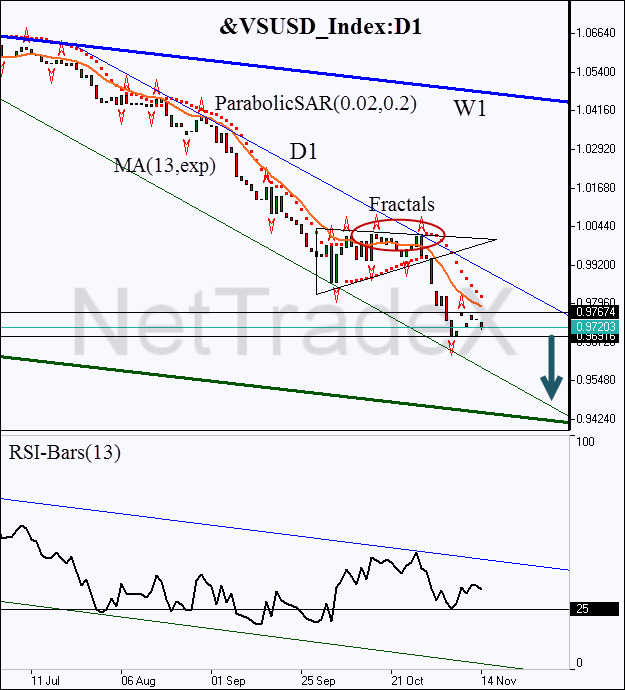 Parabolic confirms the price trend, the same as the RSI-Bars oscillator signal. The W1 trend is under the bearish influence, so we don’t have any doubt in the most probable direction of the further price movement. It should be noted that the downtrend coincided with the breakout of the lower triangle side. The upper side of the triangle is formed by the bearish pattern “double top”. The support level at 0.96916 can be used for placing a pending sell order. Stop Loss is recommended to be placed above 0.97674. This mark is strengthened by the exponential moving average, which acts as a dynamic resistance line. Conservative traders are recommended to wait for the oscillator breakout confirmation at 25% to confirm the bearish price momentum.